First-term Democratic Rep. Tom Suozzi will face a progressive primary challenge in June from a former United Nations policy analyst. Joshua Sauberman, 35, will launch his campaign for the 3rd District seat on Tuesday outside Syosset High School, his alma mater. Sauberman of Syosset said his platform is focused on improving health care access, criminal justice reform, increasing education funding and environmental protection. 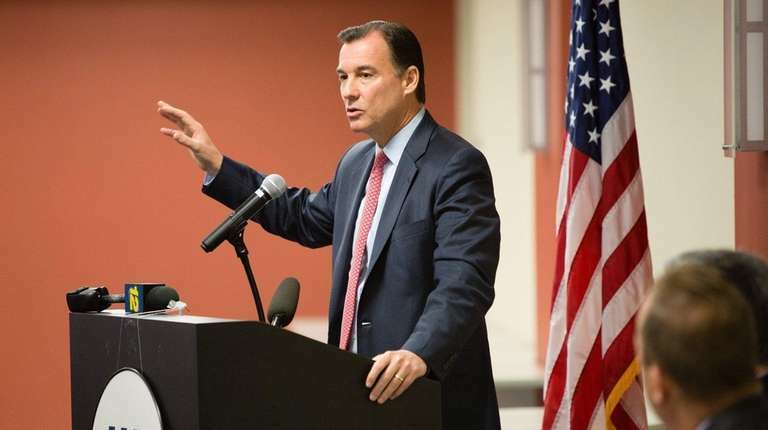 He argues that Suozzi (D-Glen Cove), a vice chairman of the House Problem Solvers Caucus — equally divided between Democrats and Republicans — has not voted consistently with his party on health care, women’s rights and military spending. “Tom Suozzi is not taking votes that are in the best interests of Nassau County working families,” Sauberman said. A Suozzi spokeswoman declined to comment on Sauberman’s candidacy. Sauberman started at the United Nations as an intern and eventually became a policy analyst, traveling to 83 countries and focusing on the Israeli-Palestinian conflict and the war in Darfur. Since 2010, he has produced documentaries about fiscal inequality. Sauberman’s Federal Election Commission filing shows Sauberman has $5,807 on hand, including $4,590 from a personal loan. Suozzi, a former two-term Nassau County executive, has $1.13 million on hand, records show. The congressional primary is June 26.